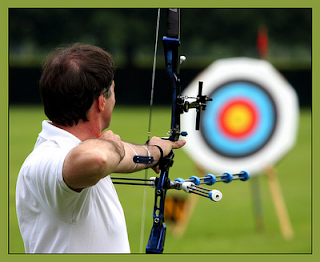 Brainstorm: accurate, aiming, bulls-eye, archery, focus, tension What focus this athlete has put into his sport. His mind is accurately focused on his aiming. His hands are firmly held onto the bow. A look of pure focus, swept across his face. The concentration he uses and you can see in his face, makes it look very obvious he will get it directly in the middle.